on the Cathedral Hill in Frombork in bishops’ palace. The history of the last glazing of Fromborks Cathedral (19/20th century) began in July of 1867, when a serious hail damaged the windows to such extent, that the Varmian chapter decided to renowate them. The first glazier to get involved in it was dr Heinrich Oidtmann from Linnich. 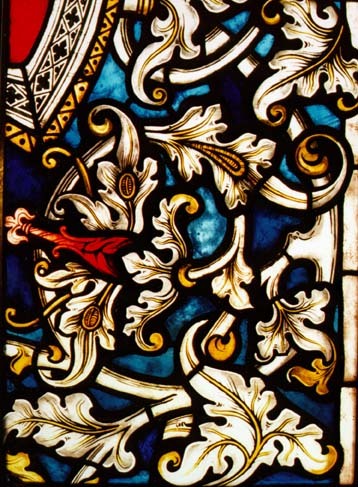 As early as in 1868, there were made cheap windows with floral themes for eight windows of the northern aisle, and richly decorated, done in traditional technique, segments for three northern windows of the presbytery. The last-mentioned depicted the figures of the apostles in the framing of architectural subjects. The works on the windows of the southern aisle started from the Saviour’s chapel in 1877. It was glazed with cheap windows, decorated by carpet-like patterns by a glazier from Wrocław, Adalbert Redner. During the next years, two windows of the southern aisle were made in his workshop. They represented the scenes from Mary’s life: The Birth and the Offertory in the Temple. These were made in the technique of painting with lacquer. 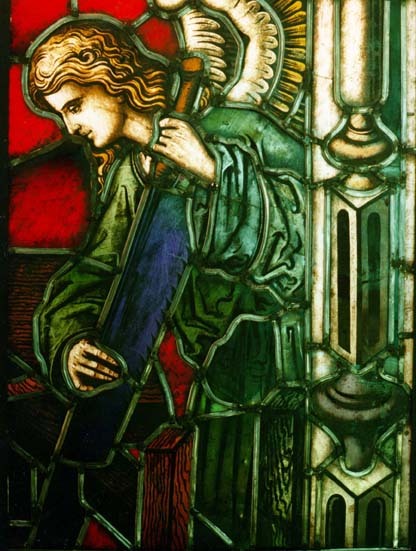 In 1878 bp Filip Krementz suggested decorating the southern windows of the cathedral by presenting the torments and joys of the Holy Virgin. Transacting, in 1886, the deal with another glazier, Josef Machhausen from Coblence, the chapter decided to reconcile existing in southern aisle Redner’s windows with the idea of bp Krementzm and to discuss with the artist the further part of representations from Mary’s life. Machhausen made five traditional windows, using English antique glass. In 1907 it was high time to make the southern windows of cathedral presbytery. The task was given to Oidtmann’s workshop, represented by the second generation, Heinrich II Oidtmann. The plans of placing here the representation of the Joy of the Holy Virgin were abandonned, and only one window was dedicated to her. 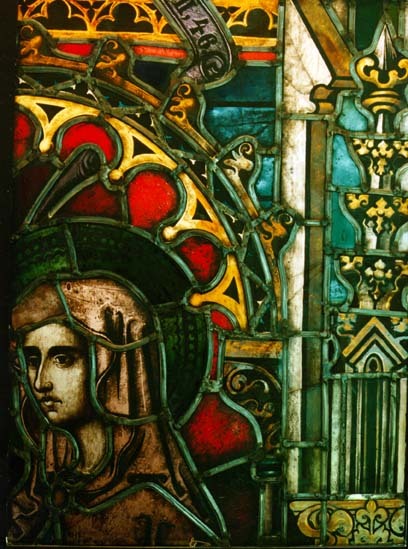 Also the idea of depicting the coronation of the Holy Virgin in the eastern window, didn’t live to be realised. It was presented only partially and a rosette with the figure of the Holy Ghost was placed there. The window the nearest to the main altar illustrates De Deum, and in the lower part the Varmian bishop with the members of the chapter were portrayed. The next two windows show the martyr’s death to the saints Andrew and Adalbert. The last changes in the glazing of the cathedral took place in 1911, when the Oidtmann’s firm replaced the windows with illustrations of the apostles, in the northern wall of the presbytery (that they were insufficiently translucent), by segments with plant themes. After the last war’s damage very little of former glazing was left from the Oidtmann’s windows, in the northern wall of the cathedral, scarcely anything was left. Only fragmentarily remained windows in the western wall give some idea of their look. Also the very richly decorated southern windows of the presbytery have disappeared. Only in the southern aisle two Machhausen’s and one Redner’s windows survived. The windows in the Saviour’s chapel, seriously damaged, have been replaced in the nineties by contemporary ones. Great number of the stained-glass windows – over 700 segments – undergoes irretrievable destruction, and only few of them (ca. 50) serious damage. From these remains, thanks to the efforts of Nicholas Copernicus’ Museum in Frombork, in cooperation with Stanisław Oleszczuk’s workshop in Wrocław, it was possible, through strenuous reconstruction, to re-create the windows exposed on the exhibition in former bishops’ palace on the Cathedral Hill. They come from the southern wall of the cathedral and were produced by three workshops: Machhausen’s in Coblence (1888), Oidtmann’s in Linnich (1907), and Redner’s in Wrocław (1877). Machhausen’s windows were the most fascinating. They were described as the best of all produced in his workshop. On the exhibition there are presented fragments of scenes of the Passion of Christ: the Crucifixion, Lament and Sepulture. We can find here also the segments with an angel and floral themes, that constituted ornamentation between the scenes. Oidtmann’s windows, although far below the level of Machhausen’s ones, are particularly valuable, for they are the only evidence of rich decoration of the southern windows of the presbytery. The workshop is represented by the scenes: Escape to Egypt, Finding the Christ in the Temple, and almost a whole scene of the Childhood of Jesus in Nazareth. 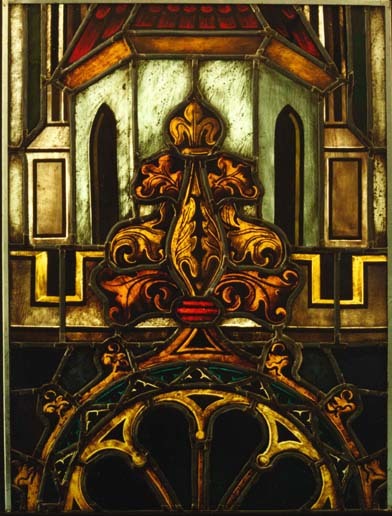 There are also the windows with elements of architecture and single segments of the scenes of Sending the Holy Ghost. From Redner’s workshop, on the exhibition we can find only one stained glass window, with carpet themes. Although not very effective, it’s the eldest of all presented segments.